Punkte Benötigt: 22150 Software ist nicht kompatibel mit mobilen Geräten und Tablets. Bitte füge diesen Titel zu deiner Wunschliste hinzu und logge dich auf einem Desktopcomputer in deinen the first club Account ein, um die Einlösung abzuschließen. ABOUT PRODUCT NEW! Windows 8 compatible*	The software is compatible with Microsoft’s new operating system, even before its official release. NEW! Incremental backups	The new version supports incremental additional backups for sector-based images for the first time. Paragon Adaptive Restore 3.0	Use this function to restore any Windows version on different hardware – from Windows XP on.… Adaptive Restore can also restore the start-up function – even after a failed system integration. Hard drives of over 2TB are supported	Supports AFDs (Advanced Format Drives) and hard drives with over 2 TB and sector sizes of over 512 bytes. Selective restoration	Reconstitute individual components of a backup: you no longer have to restore an entire backup archive in order to access certain data. 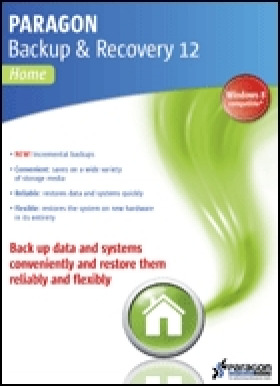 Improved Hot Backup (backup during ongoing operation)	Backup during ongoing operation is a key function of any backup software. There are two ways of doing this: Paragon Hot Backup and Microsoft Volume Shadow Copy Service (VSS). This way, you can continue to work normally, even while the backup is being created. Backup on and restoration of FTP servers	Take advantage of the options for offsite backup, online backup and restoration of an archive on an FTP server	NEW! Paragon Boot Media Builder	The Paragon Boot Media Builder enables you to create a WinPE-based rescue environment on CD, DVD, BD or USB stick, or in the form of an ISO image. This way, all functions can be executed in the rescue environment in case the computer cannot be started. FEATURES USPs: Receive Adaptive Restore 3.0 free of charge Supports the latest hard disk standards Hot backup during ongoing operation 4 different restoration environments Enables partitioning operations Handles both image- and file-based backups TECHNICAL DATA Supported Operating Systems: Windows 8 (32/64-bit) Windows 7 (32/64-bit) Windows Vista (32/64-bit) Windows XP Professional (32/64-bit) Windows XP Home Windows 2000 SP4 System requirements: Intel Pentium processor with at least 300 MHz or equivalent 256 MB RAM 200 MB free hard drive space Internet Explorer version 5.0 or newer SVGA graphics card *Once the official Windows 8 version has been released, the Window-8-compatible update for the product will automatically be provided to you free-of-charge in your Paragon MyAccount.